Doyen of Google patents, Bill Slawski, has spotted a new patent that brings genuine voice search one step closer. One of the missing links needed for any future voice search revolution, conversational (I still prefer interrogative search, as you’re not conversing – but I’m fighting a losing battle) search will enable voice assistants to use context clues to answer secondary queries intelligently. You can read more about it here. Search Engine Land has an article giving some advice on what the removal of next/prev might mean for SEO. While for me it makes sense to continue implementing it if only for the fact that Bing still uses it, there are some interesting points in the article. Online shopping has been a great thing for me – I hate the supermarket experience, but after withdrawing a similar option in January, Walmart has returned to voice shopping through Google Home. The announcement, a report on which can be found on Marketing Land is big news for voice – with a successful implementation capable of setting the bar for retailers globally. Search Engine Land features an announcement from Google which advises that errors in Search Console are set to increase – but that we shouldn’t worry. April 3, 2019: For most enhancement reports, data is now being collected from more pages than previously reported. Because of this, you might see an increase in issues and affected items/pages on these reports. Another story over at Search Engine Land details the latest addition to Bing Ads, with 70 ‘Action Extensions’ available as part of its ever improving ad offering. While you could have legitimately stated this for the last several years, the rise of data breaches and general all round reduced trust in the big tech firms has, according to Marketing Week, is reaching a point of no return as far as trust is concerned and needs a concerted effort to turn things around. In a move that will surprise exactly no-one, Google Home has started to feature ads in voice results. The story, which features over on Search Engine Land, shows how local service ads are appearing in spoken and displayed smart speaker results. In words I could never have imagined I’d type – there’s an article featured on Marketing Land which is encouraging brands to take seriously slime and speaking quietly. While I understand the reasoning, the above image keeps coming to mind. It looks great, I suspect it will be a bugger to do – but AMP for email rolled out last week – as we mentioned in last weeks ‘this week’ – but what I’ve come across since is an article on Marketing Land is an article with some tips from a company that has apparently had the time to experiment with the format. These tips include the fact that Apple Mail doesn’t support it and that you’ll have to treat it like app development. I look forward to having to learn app development if AMP for email becomes the new normal. 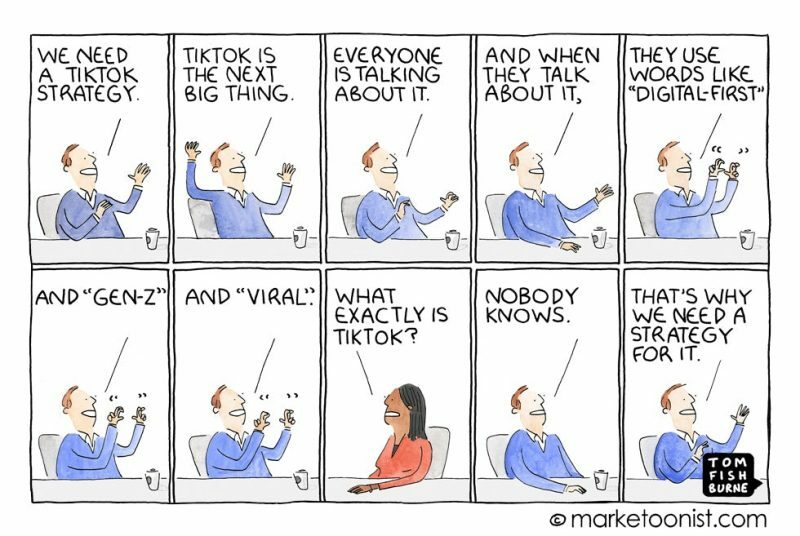 Another article from Marketing Land we missed mid-week last week explains the gains that the Spotify and TikTok ad offering might make through well executed location based marketing. The Content Marketing Institute is offering some thoughts on whether or not an April fools day prank is one worth indulging in. The answer (spoiler) is no. Although the line: “[if] your brand has never used humor or the element of surprise in its content, April 1 is not the time to start”, was a particularly good one. We keep on top of these things so you don’t have to – contact us today to see what we can do for your brand.